Buying bags run over by a Mercedes AMG GT R? Now even if you can’t afford a Mercedes AMG GT R, you can definitely own a bag with tire marks from the prestigious brand. 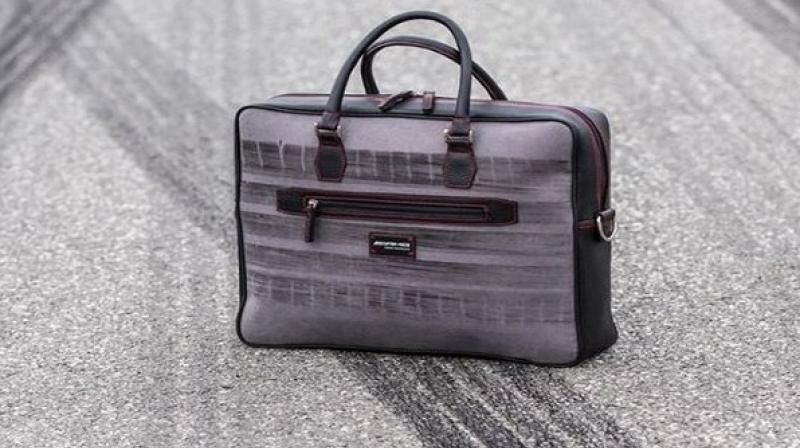 Washington: Ever imagined owning a bag that has been run over by a car? For most people, owning a bag, especially a branded one, is like an added achievement in life. People spend a lot of money on signature bags and then have to take care of it from dirt and coffee spills. Mercedes-Benz, however, had a different idea in mind. The brand in collaboration with Destroy vs Beauty (a German brand) has come up with a unique concept of purposely making the fabrics run over by cars, reported The Drive. As weird as it may sound, these bags are actually a reality! Meet Destroy vs Beauty's Burnout collection. In the unique approach, a neutral coloured fabric is first chosen to create a beautifully accented set of driver-themed gear. Then, the designers take the raw materials to a racing track where they undergo a special treatment by the raw power produced from the AMG GT R.
A flat piece of the fabric is placed on the race track, just in front of the GT-R's rear wheels. With launch control engaged, the driver then mashes the throttle in order to leave a streak of melted rubber across the material like a powerful signature. The end results are surprisingly unique pieces of art designed for both men and women. The most affordable in the collection are wallets. From laptop bags to totes, there’s an option for everyone depending on their needs. Now even if you can’t afford a Mercedes AMG GT R, you can definitely own a bag with tire marks from the prestigious brand.